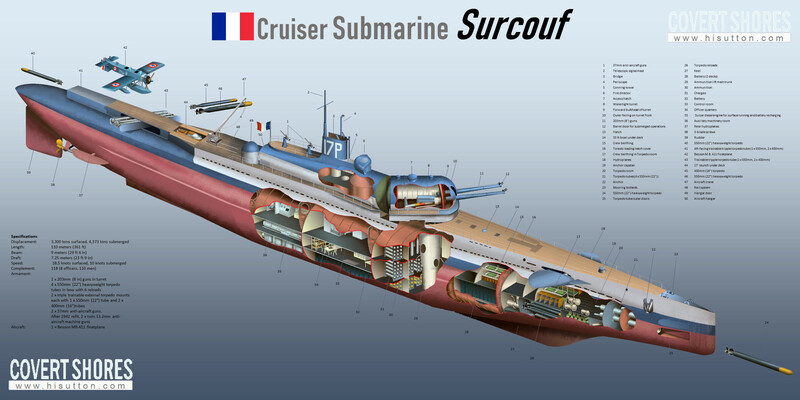 When the French submarine Surcouf entered service in 1934 it was the first in the world with an aircraft capability designed-in. It’s compact MB.411 floatplane, which folded to fit inside the integral hangar, was a work of art. 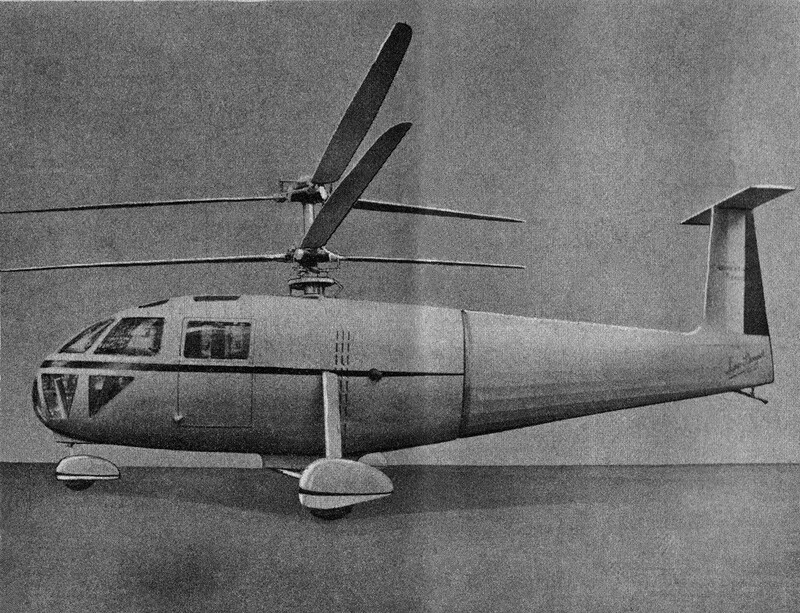 But French aviation designer René Dorand had an even more ingenious solution to deploying aircraft from submarines: a helicopter! 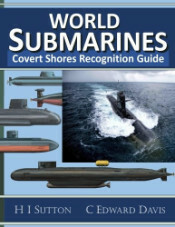 The concept of operations was incredibly clever, especially coming so soon after the introduction of aircraft to submarine operations. Launching Surcouf’s float plane must have been a major evolution (process). First the hangar would have to be opened, and the aircraft wheeled back on rails along the aft deck. Then the fuselage would be raised above the float. The wings would have to be brought out of the hangar and attached and extended, with the help of a crane. When complete, the aircraft would be transferred to the water by the crane, where it would take off. Landing and recovery would be the same in reverse. The helicopter, without a large float and with much lighter rotor blades would be much quicker to ready on the deck, and then it could take-off and land on the deck without the need to be transferred to the water. 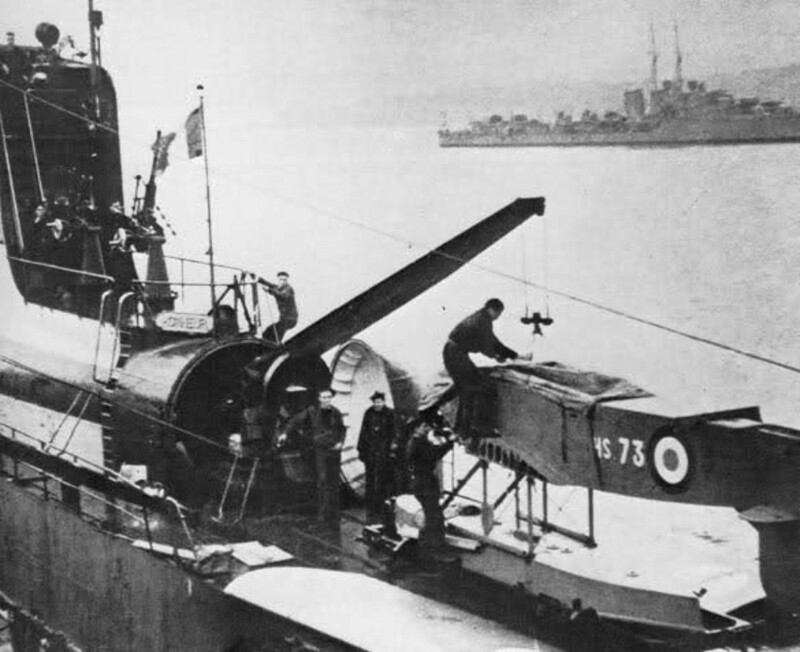 While the MB.411 float plane was intended only for artillery spotting for Surcouf’s massive twin 203mm (8”) guns, the G20 was intended as an anti-submarine aircraft, at least in its earliest conception. The project was ambitious, especially given that helicopters were in their infancy. 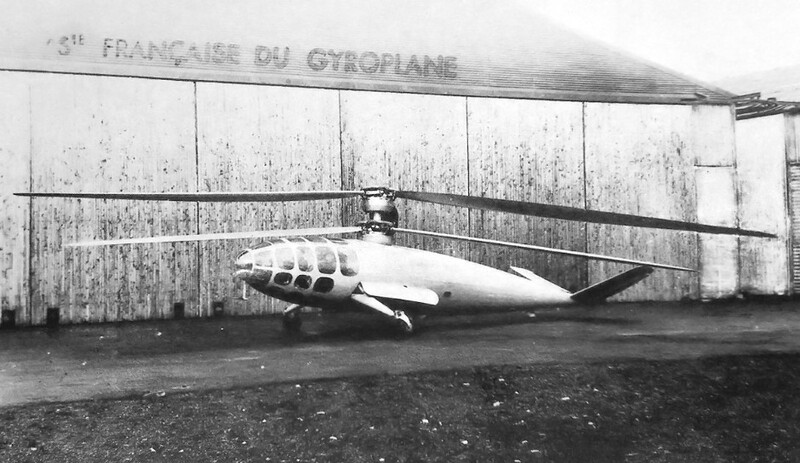 The first practical French helicopter, the Breguet Gyroplane Laboratoire, first flew in 1933. 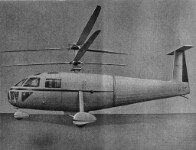 Dorand was part of the design team and separated from Breguet in 1938 to form Société Française du Gyroplane (SFG) and began design of the G20 (also known as the G.II). The G20 was had a sleek all-metal fuselage with cloth covering only used on the control surfaces which were on a futuristic butterfly tail. The coaxial contra-rotating rotors were powered by two 240 hp engines. 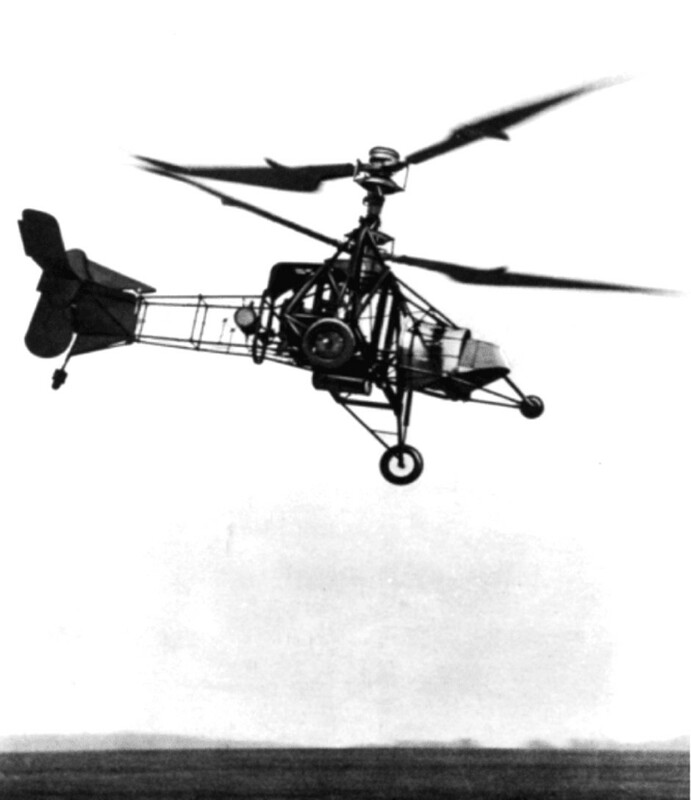 Although described as a ‘gyroplane’, which in modern parlance means autogiro, it was in fact a helicopter with powered rotors. Initially the design had three-person crew with a pilot in the nose, and two gunners behind him. The first gunner sat immediately behind and had a machine-gun firing behind and downwards, and the second stood in a cupola inside the rotor shaft, providing 360-degree arcs of fire above the aircraft. The practicality of this arrangement is open to question. There was also a modest integral bomb bay. This complex arrangement was soon simplified to an unarmed two-man crew configuration. However development stalled with the Nazi invasion of France in 1940. Production moved from Guéthary on the Atlantic coast to Chambéry in the South-East of the country, initially beyond Germany’s reach in Vichy controlled territory. When the Germans moved into the Vichy territory and discovered the helicopter, they anyway allowed construction to continue. The project moved very slowly however, picking up after the Liberation of France. By this time the Surcouf had been lost and submarine carried aircraft were an almost irrelevant topic for the French forces. The Gyroplane Laboratoire during a test flight, 2. Cutaway of G20. 3. Breguet G.IIE which first flew in 1949. 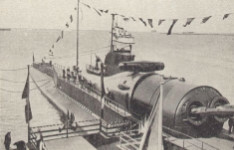 The prototype was eventually completed in 1947. 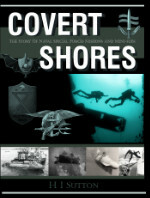 Although it conducted ground tests, the Navy was disinterested and it was never flown. It is considered that the designed performance was unrealistic and that the design was quickly becoming obsolete due to wartime helicopter developments elsewhere. The prototype G20 was never put to the test and was scrapped without attempting a flight. A sad end to a beautiful design. 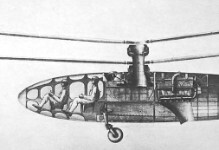 Dorand rejoined Breguet and began work on a more practical helicopter, still with the contra-rotating rotors characteristic of the Gyroplane Laboratoire and G.20. The Breguet G.11E (later modified as the G.111) first flew in 1949.